Shakespeare’s enchanting work of love and dreams and friendship is full of rich language. And this one is a sparkler. It comes during a quarrel between two dear friends, Helena and Hermia. Although they are thick as thieves, Helena exclaims this — both a warning and a delightful compliment! Don’t you think this would be a fantastic fit in the room of a fierce little girl? Or in one of sisters whose loves gets a bit tangled up sometimes? You can find this print in Emily’s shop right here. P.S. — This series — illustrated quotes from children’s books — is a collaboration between Emily McDowell and myself. You can find the whole series here. We just loved this one so much, we had to use it! Thank you for this reminder, Emily! I had a big bowl of the can’ts this morning…not anymore! I LOVE this! So feisty. But this one is my favorite: ‘She turned her can’ts into cans, and her dreams into plans.’ And as a set, perfection! I bought three of Emily’s prints for Christmas and I’m heading to her shop right now! I’m in love with everything she illustrates. She’s top notch! I am picking up my Louisa May Alcott print from the frame shop this weekend! I love this quote! How is it I am only hearing of it for the first time today! I am buying a print for my 4 year old’s room. My daughter is very petite, as am I, and this suits her perfectly. I am even considering a tatoo of this quote – on me, not her :-) Thank you for sharing it. 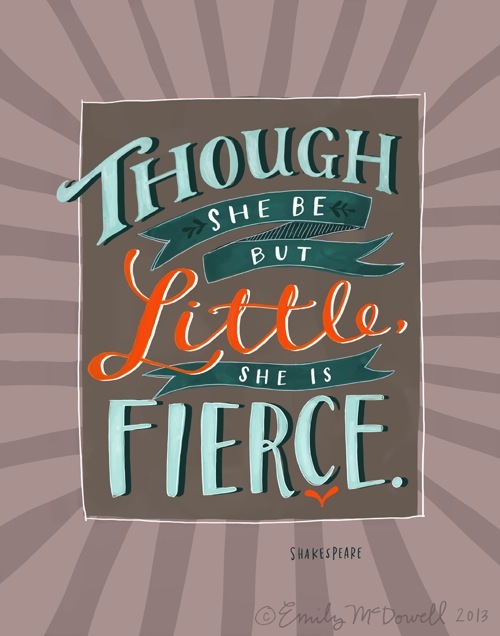 My 19 yo daughter is considering this as a tattoo – she is 5’4″ so not too small but lord is she fierce. Delighted to see you’ve posted this quote. My granddaughter turned 18 three days ago and could hardly stand the wait for her first tattoo. Guess what’s on the inside of her right upper arm…? :) Mmm hmmm, this quote. Adore this! Perfect for a little girls room!